While this week's AGM shares a name with an interesting photographer, his work wasn't as provocative as the photog. As a first round pick, there were high hopes-- but they were dashed by stalling out in the minors and not getting a fair shot at the NHL spot. This week, the profile of Terry Richardson. Richardson started in the BCHL with the New Westminster Royals in the 1970-71 season before he would move to the WHL's New Westminster Bruins for the 1971-72 season for 49 games (no record), while going 1-4 in five playoff games. In the 1972-73 season, Richardson would play again for the Bruins for 69 games and finish with a 31-22-15 and play five playoff games (no record). The Detroit Red Wings would draft Richardson in the first round of the 1973 Draft. Richardson would start off with the Red Wings, playing in nine games with a 1-4-0 record, then he was sent to the AHL's Virginia Wings-- compiling a 5-7-2 record in 14 appearances; then Richardson would go to the British League, playing in 14 games for the London Lions (no record). The 1974-75 season, Richardson stuck with Virginia for most the season, appearing in 30 games and put up a 10-13-3 record, while moonlighting with Detroit for four games and posting a 1-2-0 record. During the 1975-76 season, Richardson spent most his time with the Springfield Indians of the AHL, playing in 20 games and putting up a 6-10-1 record, while also spending four games with the New Haven Nighthawks and having a 1-2-1 record, then playing in Detroit for a game, which was a loss. It was a big 1976-77 season for Richardson. Even though he played five games for Detroit (1-3-0), Richardson had a big year in the IHL for the Kalamazoo Wings; playing 65 games (no record). played 10 games in the playoffs (5-5), and would win the James Norris Memorial Trophy for fewest goals in the league and was named to the Second All-Star Team. Richardson spent the entire 1977-78 season in the Central League with the Kansas City Red Wings, going 27-32-2 in 63 games and was named to the Second All-Star Team. Richardson signed with the St. Louis Blues in the summer of 1978. The Blues then assigned Richardson to the Central League's Salt Lake Golden Eagles, going 30-7-3 in 40 appearances, taking home the Terry Sawchuk Trophy for fewest goals against (shared with Doug Grant), and would lose the only game he would play in for the Blues. In the summer of 1979, the Blues traded Richardson to the New York Islanders, who would then trade him to the Hartford Whalers. Richardson found himself with the Springfield Indians for the 1979-80 season, playing in 46 contests and finishing out with a 15-22-7 before he would retire from the game. Currently, Richardson is an amateur scout for the Washington Capitals. 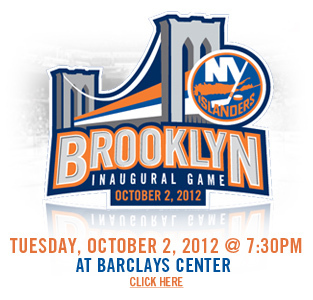 The Islanders are moving to Brooklyn. This shouldn't come as a shock to anyone. The fact that the team and the town/county couldn't figure out a deal for a new arena in the Long Island area is what really pushed the team out the door once their lease is up at the end of the 2015-16 NHL season. However, with this and the posturing around the Edmonton Oilers right now-- the last two great dynasties threatening to move out of their current position to a possible new position is a sad state of affairs for those who have grown to love and support their teams, even if they were terrible. While the Oilers move is really presumptuous and not something that will happen in the long-run, it's a chilling thought that really not many teams are safe from relocation-- especially if their owners play hardball or the city they're housed in do the same. That said, this should be a good move for the Islanders. The Barclay Center only holds 14,500 for hockey, but in the new "smaller is better" trend we've seen in the NHL (read: MTS Centre), this should be perfect for a team still trying to get their footing underneath them. Canadian Press reporter Chris Johnston mentioned that the last time the Isles reached that average attendance was in 2002-03 when they hit 14,930. Plus, it's much closer to Madison Square Garden by 20 miles, which should be a nice little option for Rangers fans to see a game. Yet, this all being said-- something about the old mausoleum will be missed by some. Many of the old Islanders probably will be a bit miffed if there is a name change or there's a logo change (despite the Fisherman logo that peek it's head out there), because that's been the identity of the team and what made the team famous. In the end, this is something that's going to possible attract some players to the team and actually build up a winner. They get the shiny building they wanted and didn't have to put out much money to do so. I'm sure the lease contract could be an interesting one and whether or not the Barclay's will actually put more seats in for hockey remains to be seen. Bottom line is that Charles Wang actually following through on his promise to move the team, even if it's only 20 miles south west. The success in this week's AGM was only hampered by fate and injuries. 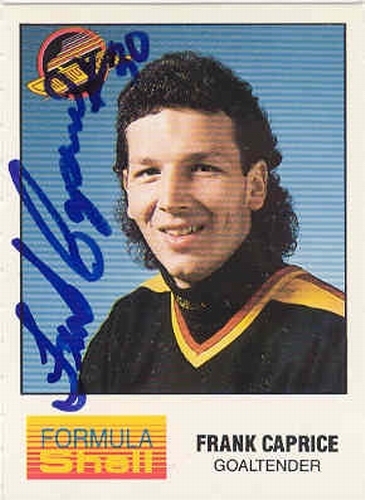 One injury begot another and made him lose his spot in the NHL due to others in the pipeline that were bypassing him. Even with that, he did find his way overseas and still chugged along into the new millennium. This week, the profile of Frank Caprice. Caprice started in Junior B with the Hamilton Kitty B's in the 1978-79 season before making the jump to the OHL's London Knights in the 1979-80 season where he would go 3-7-3 in 18 appearances; then going 1-1 in three playoff games. During the 1980-81 season, Caprice appeared in 42 games for the Knights, but only go 11-26-0. However, the Canucks would draft Caprice in the 1981 Draft in the ninth-round, which would lead to a bounce-back for Caprice in the 1981-82 season would compile a 24-17-2 in 45 games, then 1-3 in four playoff games, while also going 3-0-0 in three WJC games for Canada-- helping the Canadians take their first WJC titles. Also during the 1981-82 season, Caprice would move to the Central League for the Dallas Black Hawks and go 0-3-0 in his three games. Caprice would join the Canucks organization for the the 1982-83 season, but spend most of his time in the AHL with the Fredericton Express, playing in 14 games with a 5-8-1 record, then appearing in one Canucks game in relief, but didn't figure in the decision. For the 1983-84 season, Caprice would split his time between Fredericton for 18 games (11-5-2) and then appearing in 19 games for the Canucks (8-8-2). Incumbent goalie Richard Brodeur would be sent to the minors for the 1984-85 season, which gave Caprice the chance to take over the top spot. Yet, Caprice struggled at the start, then tore his hamstring-- making him miss three months-- and in 28 games, Caprice would finish up with a 8-14-3 on the year. The 1985-86 season had Caprice once again split time between Vancouver (0-3-2) and Fredericton (12-11-2), with a knee injury in between. For the 1986-87 season, Caprice would spend more time in Vancouver, posting a 8-11-2 record in 25 games, while turning over a 5-5-0 record in 12 games with Fredericton. Caprice would back up a young Kirk McLean for the 1987-88 season, playing in 22 games and post a 7-10-2 record for this troubles. Caprice was sent to the IHL for the 1988-89 season, playing for the Milwaukee Admirals while going 24-12-0 in 39 games. The 1989-90 season saw Caprice traded to the Boston Bruins and placed in Milwaukee for 20 games (8-6-3) and then being moved to the Maine Mariners of the AHL for 10 games and finishing with a 2-6-1 record, a bounce back from a broken hand he suffered in training camp. After taking a few years off, Caprice would resurface in Europe, playing from the 1992-93 season until the 1995-96 season with the Italian League's HC Gardena where he would play 77 times in that span. During that time, Caprice would return to Vancouver....but with the Voodoo of Roller Hockey International for two games, going 0-0-1. For the 1996-97 and 1997-98 seasons, Caprice would head to Britain and play for the Cardiff Devils, helping them to the 1997 British championship and a third place finish in 1998. The 1998-99 season, Caprice would come back to North American to play in the Central League's Corpus Christi Ice Rays for 15 games and post a 9-5-1 record, but would relocate back to the British League with the Ayr Scottish Eagles, going 2-5-0 in seven games, then 0-3-1 in four playoff games. After that, aside from an appearance in the 2001 Allan Cup to help out the Dundas Real McCoys, Caprice retired from hockey. Thanks to one major injury, it changed the career of Caprice and may have changed his career and the history of the Canucks if he was able to grasp the chance at taking over the #1 goalie spot. However, his loss was Kirk McLean's gain and helped the Canucks build themselves up to a contender-- who knows what could have been if Caprice was in that spot. With me, I enjoy running bits and this one will be no different. Rather than get hung up on the NHL scuttlebutt, it's time to keep up with the new teams in the minor league ranks. Overall, the expansion teams have budded up over the ECHL this year, while the CHL had some teams taken and introduced a new team to their fold of teams. 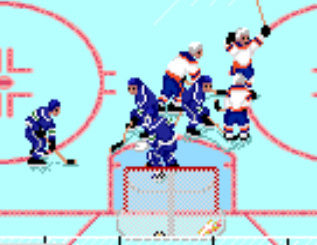 On this, we'll put the records, placement, and top scorers/goalie on their team. 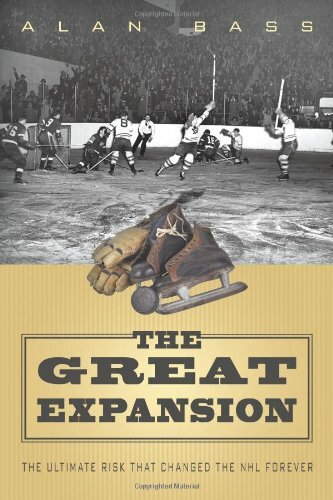 Something to expand your mind about the place of expansion teams. They say it's hard to pull yourself away from you passion. Most times, people try it out and then can move on easily. Other times, people just can't break themselves away-- even from the playing aspect of things. This week's AGM left and came back and left and came back and still was decent enough at the end of it all. This week, the profile of Doug Keans. Keans started his career with the minor midget Oshawa Legionnaires in the 1975-76 season, then moving the OHL's Oshawa Generals for a single game. Keans stayed with Oshawa, playing in 90 games between the 1976-77 season and the 1977-78 season, though the records for those years are not readily available. The Los Angeles Kings selected Keans in the 1978 Draft in the 6th Round and they played him in the IHL with the Saginaw Gears for the 1978-79 season, playing in 59 games, then spent 22 games with Saginaw in the 1979-80, but would be called up to the AHL's Binghamton Dusters for eight games (3-3-2), as well as going to the Kings for 10 games and finished up there with a 3-3-3 record, plus 0-1 in the playoffs. Keans primarily spent the 1980-81 season in the Central League, playing for the Houston Apollos (3-4-4) and Oklahoma City Stars (3-5-0), while getting in nine appearances for the Kings (2-3-1). The 1981-82 season had Keans spend most the time as a back-up in Los Angeles, getting into 31 games and posting a record of 8-10-7 on the year (0-1 in two playoff games), while playing in 13 games with the AHL's New Haven Nighthawks and finishing there with a 5-5-1 record. More of the same with the split situation in the 1982-83 season, seeing Keans spend 30 games in New Haven with a 13-13-2 record while playing in only six games in Los Angeles, going 0-2-2 for his troubles. The Kings put Keans on waivers in the summer of 1983, in which the Boston Bruins would pick him up and have him back-up Pete Peeters for the 1983-84 season, posting a 19-8-3 record in 33 appearances, despite having knee surgery in the middle of the season. Keans got into 25 games in the 1984-85 season with a record of 16-6-3 (2-2 in four playoff games), while in the 1985-86 he went 14-13-3 in 30 games. During the 1986-87 season, Keans saw a record number of games in the NHL, appearing in 36 while finishing with a 18-8-4 record, but going 0-2 in two playoff appearances. 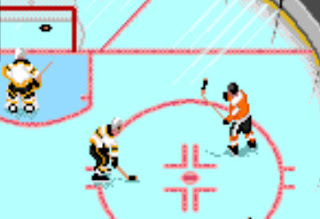 During the 1987-88 season, Keans played in 30 games with Boston (16-11-0), only to be sent down to the AHL's Maine Mariners when the Bruins acquired Andy Moog. With the Mariners, Keans went 8-2-0 in 10 games and 5-5 in 10 playoff games. The 1988-89 season saw Keans in the AHL again, playing in 32 games with the Springfield Indians, posting a 11-16-2 record, while also spending four games with the Baltimore Skipjacks, compiling a 1-2-0 record. After that season, Keans would retire. Yet, retirement only lasted a few years, as Keans would suit up for the Minnesota Iron Rangers of the amateur ranksin 1992-93, going 2-6-0 in eight games, while also playing for the Jacksonville Bullets of the Sunshine League, going 8-5-0, then 2-2 in the playoffs. He was listed for the Bullets in the 1993-94 season, but didn't play. After a year off, Keans returned during the 1995-96 season for the Bullets, going 5-3-0 in nine games and rostered for the ECHL's Jacksonville Lizard Kings in the 1996-97 season, but never saw action. This time, his retirement was for good. That's when you know you have the bug and passion to play. The ability to not really get too far away from the game and still be able to play at a decent level when returning, albeit in a lower minor league. 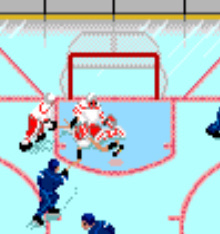 In the only game on the Sunday docket, the Anaheim Ducks got some heroics from Teemu Selanne, who notched the game winning goal in the third to secure the 2-1 victory. Ryan Getzlaf had the other goal for Anaheim while Derek Roy tallied for the Stars. 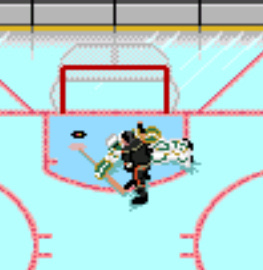 Jonas Hiller stopped 28 shots in the victory for the Ducks. So, that's going to be it for this side of the blog. Much like the Center Ice Package, this was merely a preview. 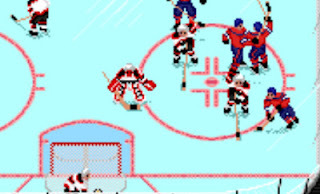 If you want to follow the rest of this project, it'll be over at NHL 2012-13 Via NHL94 on the Tumblr. Follow, bookmark, whatever. Just get 'er done. Not as much in-depth stuff, but still good enough. Pekka Rinne bounced back from a rough first outing and Mike Fisher kept his hot streak alive with the game winning goal in overtime as the Predators beat the Blues. St. Louis got their first goal of the season by Patrik Berglund, while Brian Elliott stopped 26 shots. The lowly Blue Jackets saw the lack of offense as they only mustered 18 shots on goal against the Blackhawks, making it an easy night for Corey Crawford. Marian Hossa, Marcus Kruger, and Viktor Stalberg scored for the Blackhawks in the win. The new era in Minnesota started with a shutout, as Niklas Backstrom posted 31 saves in the winning effort. Big free agent Ryan Suter notched the insurance goal late to seal the victory. After being down 0-2, the Coyotes picked up where they left off last season with a come-from-behind victory over the Stars with two goals 1:30 apart from each other. Mike Smith made 31 saves in the victory. Last second heroics, as Ryan Nugent-Hopkins scored with five seconds left in regulation as the Oilers beat the Canucks, despite Roberto Luongo making 32 saves in the losing effort. Drew Stafford goal three minute into over time helped the Sabres win their opening night tilt. While M-A Fleury had a 38 save night, it was not enough for the Penguins. James Reimer put the summer goalie coach quarrel behind him and put up a 30 save performance while Matt Frattin took over the game early for the Leafs, helping take down their long-time rival. Daniel Alfredsson's goal late in the third helped the Senators get past the Capitals and Braden Holtby. Though Marcus Johansson had a great game for the Caps, Craig Anderson was too much for the rest of the Caps, stopping the other 30 shots he faced. A highlight goal from Rich Perverley and Patrice Bergeron helped the Bruins beat the Devils. Tuukka Rask stopped 25 shots in the winning effort, while Ilya Kovalchuk's offense was the bright spot for the Devils in the game. Even without much goal support, Ilya Bryzgalov came up big to help the Flyers win their first two games of the season, getting a good showing from his defense, as well. Newcomer Brad Boyes had the lone tally for the Islanders. With a new goalie in net, the Lightning broke open the scoresheet with Steven Stamkos getting his scoring touch back with two goals, including an open net. Anders Lindback faced 32 shots and saved 30 of them for his first win with his new team. In the lone afternoon tilt, the Carolina Hurricanes got a stellar performance from Cam Ward, who stopped all 32 shots he faced and newcomer Alex Semin scored the game-winning goal against the Winnipeg Jets. Chad LaRose had the other goal for the Canes, while the Jets got 25 saves from Ondrej Pavelec. In a non-defensive game, both Anaheim's Saku Koivu and San Jose's Logan Couture netted hat-tricks, but it was Logan Couture's two-goal game, his second the OT winner, that boosted the Sharks over the Ducks. 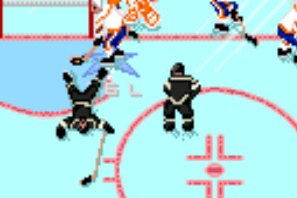 Corey Perry netted the other goal for the Ducks. The banner raising night for the Los Angeles Kings were quickly dashed as the Rangers jumped on the Kings early and often, finishing the night with a 5-2 victory. Rick Nash's debut was effective with two goals and Brad Richards got a jump-start with two of his own. Anze Kopitar and Dustin Penner scored for the Kings. The semi-rivalry met up for opening night, but the Isles got the best of this round as John Tavares and P-A Parenteau netted the goals for the Islanders, helping Evgeni Nabokov-- who had 36 saves in the winning effort. Brandon Sutter got the lone goal for the Pens, who had to play without Evgeni Malkin for the third period after getting his legs tangled up in a scrum. Without Zach Parise, the Devils faired well, but were downed by Jason Chimera's overtime winner for the Capitals. Newcomer Mike Ribeiro score two in his Washington debut, while Michal Neuvirth stopped 48 the start. Martin Brodeur showed his true stopper side with 47 saves of his own, as the Devils got three points from Adam Henrique. Pavel Datsyuk scored two goals, while Todd Bertuzzi had a goal and an assist in the Red Wings win. The Predators had to swap goalies after the first period as Pekka Rinne only stopped seven of the 10 shots he faced. Mike Fisher was the lone bright spot for the Preds with a goal and assist. A mistimed line change sprung David Booth for his second goal, the overtime winner, to ruin Bob Hartley's debut as Flames' head coach. Miikka Kiprusoff stopped 33 shots, but got little help from his teammates who only put 21 shots on the Canucks net, rookie Roman Cervenka netting the lone Flames goal. Ryan Kesler helped with assists on both Booth goals. Standing tall in net, Semyon Varlamov got the first shutout of this young NHL season, stopping all the Blues threw at him. Meanwhile, Jaroslav Halak came back from last year's knee injury to stop 28 shots, but it wasn't enough when he didn't get help scoring from his teammates. Steve Downie, Ryan O'Reilly, and Jamie McGinn were the unlikely goal-scorers for the young Avalanche squad. The Ottawa Senators tried to regain the surprising status they had last season, trying to build off their momentum. 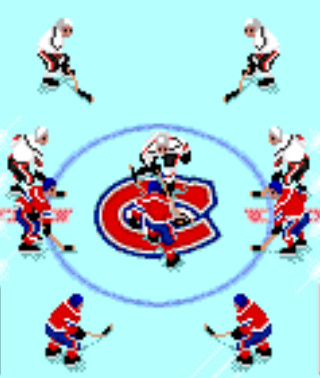 However, Rene Bourque put up two goals and lifted the Canadiens to their first victory again under Michel Therrien by the 5-3 score. Carey Price stopped 28 of the 31 shots the Sens threw at him, as well as tallying an assist. Down the ice, Craig Anderson saw 40 shots and stopped 36 and didn't get much help as the Senators kept getting into penalty trouble, thus the barrage of shots. Both Scott Hartnell and Claude Giroux had a goal and an assist as the Philadelphia Flyers try to expand from last season with a 3-2 win over the Bruins. Ilya Bryzgalov stopped 32 in the victory, trying to rebuild his trust with the Philadelphia Faithful. The first start of the Tuukka Rask era in Boston was a bit shaky, but he stopped 33 shots and got help from David Krejci's two goals-- but came up short in the end. As you know, I love gimmicks. And I love NHL94. 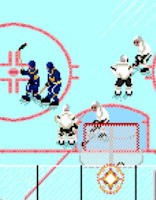 Therefore, why not have a gimmick that involves NHL94....again. 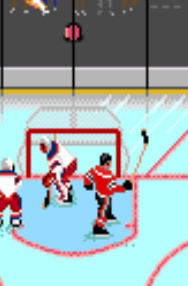 Starting on Thursday and going until they figure out the damn lockout-- I'll be simulating all the games that have been cancelled on the NHL94 ROM emulator. That's right, we'll have a full 82 game season as it stands and figure out how the hell this will all pan out. Now, of course-- there's issues. 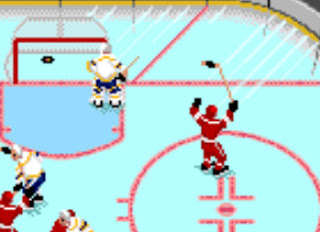 As of now, they don't have a NHL13 ROM update for the NHL94 platform, so I'm going to have to use the NHL12 rosters at the time being. Hopefully trying to get the playoff updated roster so I can get at least some accuracy. 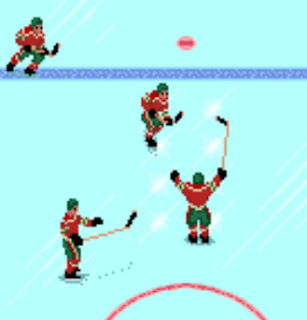 Anyway-- starting tomorrow with four games on the docket, we'll have some faux NHL action. Grant started his time at home playing for the Corner Brook Pats in the Newfoundland Junior league in the 1964-65 season then seems like he disappeared for the 1965-66 season before moving onto the Newfoundland Senior League. In the Newfoundland Senior League, Grant played for the Corner Brook Royals starting in the 1966-67 season, going 12-8-2 in 23 appearance, then 1-2 in three playoff contests. The 1967-68 season had Grant appear in 40 games with a 19-16-5 record, then going 8-4 in the playoffs to represent the Maritime Provinces in the Allan Cup where the Royals would lose in the semifinals. Grant returned again for the 1968-69 season, posting a 17-18-4 record, then going 1-2 in four Allan Cup game play-ins. As Grant came back for the 1969-70 season, he put up a 18-17-5 record (3-4 in the playoffs), while he enjoyed success in the 1970-71 season but going 16-13-6 (3-8 in the playoffs) while being named to the First All-Star Team for the end of the year. Follow those years, Grant decided to move to the Canadian college ranks to play for Memorial University in St. John's, Newfoundland for 14 games in the 1971-72 season and being named to the First All-Star Team. Because of that performance, the Detroit Red Wings signed Grant in March of 1972. 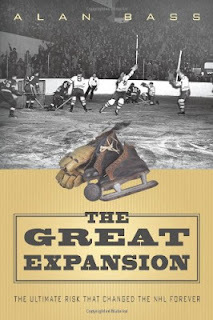 Grant went to the Central League's Fort Worth Wings for three games (1-2-0) before filling in with the Grand Falls Cataracts in the Allan Cup for a game, a loss. In the 1972-73 season, Grant joined the AHL's Virginia Wings, playing in 51 games (no record) and posting six shutouts, as well as going 6-6 in the playoffs and taking First All-Star Team honors in his first full pro-season. During the 1973-74 season, Grant started the with the Virginia Wings and go 1-3-2 before he got called up to the Detroit Red Wings and finish 15-16-2 in 37 games for the Red Wings. Another split season for Grant occurred in the 1974-75 season where he would post a 1-5-0 record in Detroit, while finishing with a 14-11-8 record in Virginia. During the 1975-76 season, Grant spent most the season in AHL with the New Haven Nighthawks, compiling a 8-13-2 record in 23 games, while going 1-1-0 in Detroit. 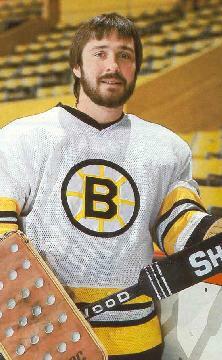 Grant was traded to the St. Louis Blues in March of 1976 and finished in New Haven. For the 1976-77 season, Grant played 17 games for St. Louis (7-7-3), then spending 20 games in the Central League with the Kansas City Blues (10-6-4). The Blues used Grant for nine games in the 1977-78 season (3-3-2), while being assigned to the Central League's Salt Lake Golden Eagles, posting a 17-13-3 record-- being named to the Second All-Star Team and winning the Terry Sawchuk Trophy with Ed Staniowski for fewest goals against. For the 1978-79 season, Grant played mostly in Salt Lake, finishing with a 15-12-3 record in 31 games, then 1-2 in the playoffs; as well as getting another Sawchuk Trophy with Staniowski. Grant also got the call from St. Louis for four games (0-2-1). With Grant returning to Salt Lake for the 1979-80 season, where he would go 24-12-2 in 38 games, then 7-2 in the playoffs to help the Golden Eagles win the Adams Cup and Grant would get the Max McNab Trophy for Playoff MVP. Grant did play a game in St. Louis, but didn't register in the decision. Grant signed with the Golden Eagles for the next two season starting in the 1980-81 season, where he would only play five games that season (3-1-0) and then seven games in the 1981-82 season (2-3-0). After that season, Grant would retire from hockey. It wasn't the most orthodox of treks and honestly, this is where the expansion era helped out a lot-- but in the long run, Grant accomplished a lot with a little in front of him and had a lot of help along the way later on down the line. He got his team awards and personal awards and shouldn't have much to overly complain about outside of not getting a better shake in the NHL. Going Viral or Gaining Vitriol?? As we all know, tension is high when it comes to the lockout. Fans are getting stir-crazy, the information coming out is never good for too long or vague, and the people already presuming gloom and doom are licking their chops when it comes to their prediction being right. More over, the players are becoming more and more vocal about this disdain for the owners and the lockout. Of course, the players have that freedom. The NHL has a bylaw restricting the owners or those in the front office from talking about the CBA or the lockout. Jim Devellano can attest to that. Krys Barch's crazy Twitter ranting about players being born to play and the owners not knowing what it's like. Alex Ovechkin and Ilya Bryzgalov talking about how players could stay over in the KHL, especially if they have Russian passports or don't like the new CBA. Dan Boyle saying not all the owners are on the same page. Mike Commodore using his rage against Verizon to take jabs at Gary Bettman. Most anything Allan Walsh tweets. Karl Alzner pretty much spilling the beans that the players aren't going to win, but it being a matter of how little they'll lose. While it's good the the NHLPA to allow their members to freely speak their mind and frustration, they may want to reign in their contingency just a little bit-- maybe going full cliche mode for some of them. Especially with what Alzner said, it's almost like he's taking a knee early on. The PA had the public opinion with them, and even with some people swinging hatred to both sides-- people still seemed to have an edge on the PA's side rather than right down the middle. Yet, with every comment that a PA member is making, the vitriol is being spewed their way in bigger spurts than there were at the beginning of this. 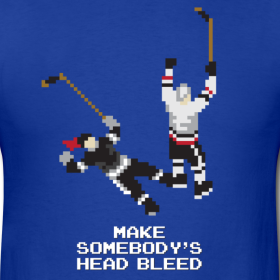 For the NHLPA, they got the social media movement out there from the start. 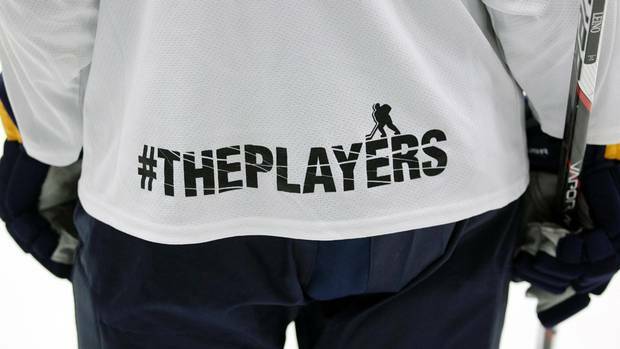 Creating hashtags for their cause (as seen above on the NHLPA practice jerseys), putting out a viral video showing their passion, and just making sure their presence was felt to the masses and the people who will see what they are standing for, especially since the NHL owners have no voice due to the gag order. With the PA allowing their guys speak their mind, it's a nice interactive instance from time to time. However, the more they speak, the less sympathy people are taking on them and the more annoyance it is becoming. It's one thing to be open and freely express your views, it's a whole other when those views start to sway people in the other direction. There are times when you can become too opinionated and people start to roll their eyes. Social media or just the easy accessibility to players is the biggest it has been before. The NHLPA probably didn't take that into account for....well, most anything-- lockout or otherwise. While their campaigns on it have been widely well received, the fact of the matter is the thing they viewed as the biggest upside for them may end up being a big free-fall in favor, as well. With the AHL in full-swing with training camp, one noticeable absentee is Jeff Skinner. The young forward said last week he wouldn't be reporting to the AHL's Charlotte Checkers camp for one reason or another. Carolina Hurricanes GM Jim Rutherford said that the decision for Skinner not to report was mutual between the club and the player, but it makes you wonder if this is a small alarm in what it could be like to deal with Skinner in the future. Other players like Ryan Nugent-Hopkins and Jordan Eberle have reported to their AHL assignments (as well as Taylor Hall when he gets healthy again), same goes for Braden Holtby, Adam Henrique, and Brayden Schenn. Why does Skinner feel that he should be above the others and not actually continue to play at the higher level that the AHL is going to bring to the table this season?? Sure, the fact that Skinner has a Calder Trophy and been in the NHL full-time since he was drafted could be the reason he doesn't feel the need to be in the AHL at all because he feels he's above that. He's entitled to that thought, though it probably leaves a bad taste in the mouth of the Hurricanes management who actually gave Skinner a six-year contract extension, just short of $35M over the contract term. Even though this AHL assignment could be above him, you almost would wish that he would continually want to play in order to keep his profile up. The Hurricanes were very aggressive this past summer with many offensive acquisitions (Jordan Staal and Alex Semin), so Skinner playing in any form probably wouldn't be the worst for him or the Hurricanes. Especially with how competitive it'll be for the top-six spots in Raleigh, Skinner could actually slip down the chart should be come out of the gates slow and then have the critics on his case for not taking the assignment in the first place. Not only that, but it makes Skinner look like a prima donna when it comes to playing the game and not going for something that could only be good for him. The Washington Caps fans know about this an even made an animated GIF about it, too. If he doesn't actually pick-up his game when the NHL comes back into our lives, then we know that he made a terrible mistake by not actually taking this assignment. More over, it could sully his name when it comes to his standing in the Hurricanes book. While they say the decision was "mutual" the fact that Rutherford didn't want to overly argue with his young star could be a reason, hoping he would smarten up and actually take the assignment in stride. There's still a chance that young Skinner would take the assignment and show up in Charlotte at some point in the AHL season, though he'd be a little behind. Considering the odds of him going overseas at this point are a bit lower than they were a month ago, the AHL could be the only outlet if the NHL is going to drag this lockout further. Skinner would probably be wise to head there (or somewhere) sooner rather than later. Unlike another athlete with the same name, this week's AGM wasn't a first overall pick in the Draft, he didn't win the top player in any ranks, but they did win a National Championship, though several decades apart. However, this week's AGM was most known for his bright mask, if nothing else. This week-- the profile of Cam Newton. Newton's rise to prominence began in the OHL with the Toronto Marlboros in the 1966-67 season, playing in 18 games and was the hot hand going into the playoffs playing in 10 games and aiding the Marlboros to win the Memorial Cup in 1967 winning in five games against Port Arthur. Newton stayed with the Marlboros in the 1967-68 season, playing in 18 games, as well as part of the 1968-69 season, appearing in 27 games. However, midway through the 1968-69 season-- Newton was traded to the Kitchener Rangers, where he would play another 24 games to end out the season. While the 1969-70 season had Newton get into 42 games with Kitchener, then four playoff games where he'd go 0-3. The Pittsburgh Penguins drafted Newton in the eighth round of the 1970 Draft and would place him in the Central League with the Amarillo Rattlers, playing in 15 games during the 1970-71 season. Newton would also get a call-up to the Penguins for five games, recording a 1-3-1 mark in those games. For the 1971-72 season, Newton was assigned to the AHL's Hershey Bears where he would play in 35 games and put up a 13-17-4 record in those games, then losing his only playoff appearance. 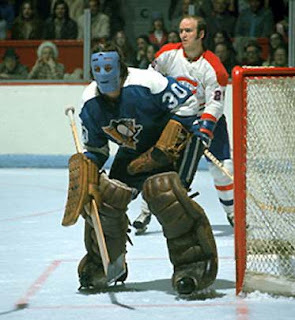 Newton would spend a majority of the 1972-73 season with the Bears, playing in 18 games and posting two shutouts, while also appearing in 11 games for the Penguins when he was called up, finishing with a 3-4-0 record in that time. To forge his path, Newton moved to the WHA, signing with the Chicago Cougars and playing in 45 games in the 1973-74 season, compiling a 25-18-2 record in that season. Back with the Cougars for the 1974-75 season, Newton played in 32 games and post a 12-20-0 record. The 1975-76 season was an adventurous one, as Newton was picked up by the Denver Civics during the Expansion Draft, and while the Civics would move to Ottawa halfway during the season, Newton went 4-6-0 in ten games before the Civics folded midway through the season. Newton was signed by the Cleveland Crusaders after the Civics ceased operation and he would appear in 15 games and put up a 7-7-1 record. The 1976-77 season had Newton in the North American Pro League with the Erie Blades, where he would only play in four games, posting one shutout, before he would leave the game and retire all together. From having the hot hand to get the Marlboros a Memorial Cup to being recognized for his baby-blue mask when he was in the NHL, Newton left a bit of a mark on the annals of history, though it was a small mark altogether.